Will Brazil implement pension reforms? World Bank chief economist Kaushik Basu said on Tuesday that there is need for a BRICS bank, but warned it would be a “humongous task” to set up. Steps toward establishing the development bank are expected to be finalised at the upcoming Fifth Annual BRICS Summit in Durban, South Africa. South African officials have signaled that a BRICS-led bank could mobilise domestic savings and co-fund infrastructure in developing regions. At a time when many countries were succumbing to the global financial crisis, with some resorting to currency manipulation, they highlighted the importance of the “pooling of members’ foreign exchange reserves with the view of using them to support each other at times of balance of payments or currency crisis”. BRICS countries currently hold reserves totaling $4.5 trillion. In an exclusive op-ed to The BRICS POST last week, South African minister of international relations and cooperation Maite Nkoana-Mashabane said that one purpose of this bank would be to supplement the existing efforts of multilateral and regional financial institutions for global growth and development. South Africa has indicated that it would like to host the bank. Basu, who was in Johannesburg for a public lecture, also address South Africa’s role in the global economy. 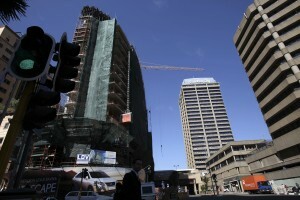 “South Africa needs to focus on growth and investment,” he said. 57 founding members, many of them prominent US allies, will sign into creation the China-led Asian Infrastructure Investment Bank on Monday, the first major global financial instrument independent from the Bretton Woods system. Representatives of the countries will meet in Beijing on Monday to sign an agreement of the bank, the Chinese Foreign Ministry said on Thursday. All the five BRICS countries are also joining the new infrastructure investment bank. The agreement on the $100 billion AIIB will then have to be ratified by the parliaments of the founding members, Chinese Foreign Ministry spokesman Lu Kang said at a daily press briefing in Beijing. The AIIB is also the first major multilateral development bank in a generation that provides an avenue for China to strengthen its presence in the world’s fastest-growing region. The US and Japan have not applied for the membership in the AIIB.